Nice big hostel with good beds, not many outlets in each room but there are extension cords available. Within walking distance to all the best places in Salzburg, and the sound of music every night really gets you into the atmosphere. Laundry and bag storage were easy and convenient. This was a very nice hostel in a great location, in proximity to the train station and downtown. The screening of the Sound of Music and free salad bar was a nice touch as well! I liked this hostel! It was clean and the staff were friendly. There was an issue with the sink in my room making a loud, persistent sound but they were quick to offer me new accommodations. I also would love it if there was a plug near every bed! Great location, very clean, and nice hostel!! Such a great hostel! I stayed here two nights and wish it was longer. Super great atmosphere and nice accommodations. In a great location super close to the city centre so it’s no problem to stop back at the hostel for a rest in the middle of the day. The beds were very comfortable and the hostel was cute and friendly. My only complaint was that the girls on my floor only had one functioning toilet, which was really frustrating and created long lines at times. But the lockers are very secure and the hostel location is about 6 minutes from Mirabell Gardens, which was nice. 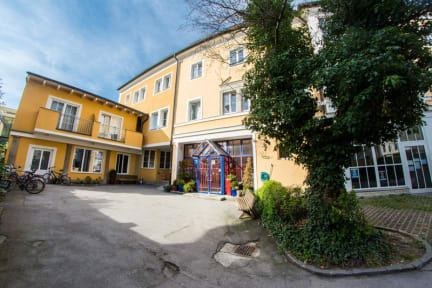 Yoho Salzburg is a great place to stay in Salzburg, very well located, great staff, clean and good value for money breakfast. The only downside is that they don't have power plugs by the top beds. I'd stay again. This hostel is in a good location close to the city centre and has a reasonably priced bar and breakfast. However, the reception staff weren’t that friendly and did not explain the protocols of breakfast, directions and whether towels could be rented at check in. One of the locks on the showers was also broken. Also, there was only one communal power socket for all in the room which had to be shared via an extension lead and there were no individual sockets close to beds. Toilet gets cleaned only once a day no matter how dirty it is. Stuff not extra welcome and friendly.